With two brews on the BC market broadcasting that their fresh hops were grown at Sartori Hop Farm I thought it would make sense to do a comparison. 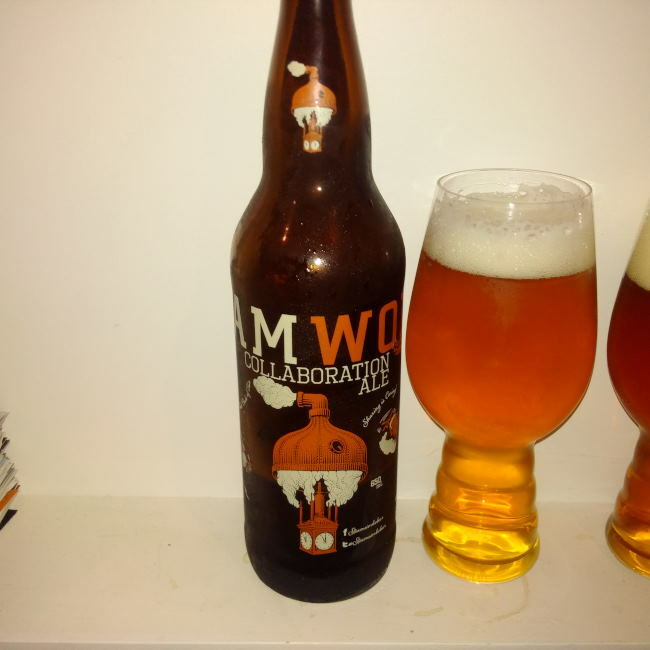 Steamworks Brewing out of Burnaby has Launched their new “Hop Attack! 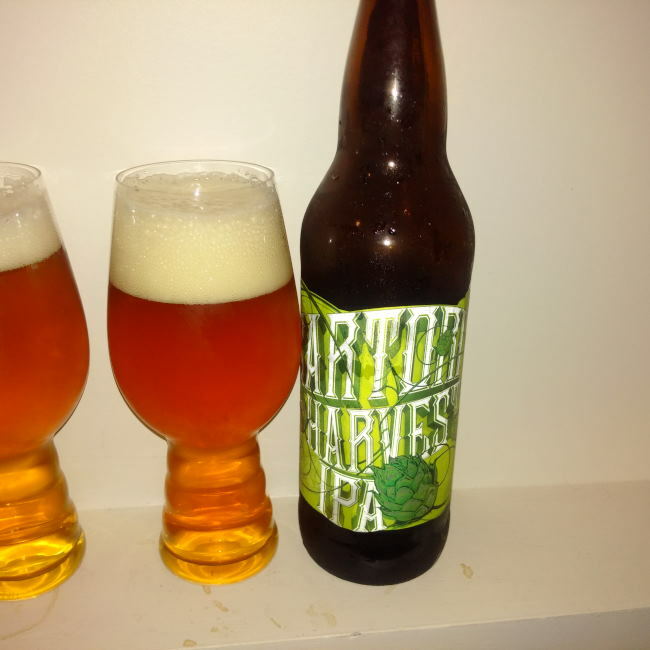 Fresh Hops IPA” a collaboration with Sartori Hop Farm while Driftwood Brewing in Victoria has released this years batch of “Sartori Harvest IPA”. Both beer are brewed with hops that are picked fresh from the Sartori Hop Farm and rushed back to their respective breweries to brew with. The beer pours a copper orange colour with a slight cloudiness and a quickly dissipating white head. The aroma consists of earth, resin, citrus, grassy and herbal notes. The flavour is of caramel, resin, pine, earthy, citrus, orange, mild bitterness, oily and mild dank finish. The alcohol content comes in at 6% with an IBU of 50. The beer pours a deeper copper/orange colour with a cloudiness and an off white head that lingers and leaves lacing. The aroma is of resin, citrus, grassy hops, herbal notes and a dank finish. The flavour is of caramel, citrus, strong citrus rind, big pine, resin, earth, herbal almost medicinal, oily with a good bitterness and a dank finish. The alcohol content comes in at 7% with a guessed IBU of 75 as that is what other years have come in at. When it comes down to it both beers are very different. Both are well made beers but hitting on different sides of the IPA category. Sartori Harvest may be a very hard beer to acquire every year but Steamworks has brought a beer to the table that deserves to be recognized. All I can say is that between the two beer I finished the Hop Attack! first. I just wish local fresh hopped beer had the same bitterness as a regular West Coast IPA that I love. 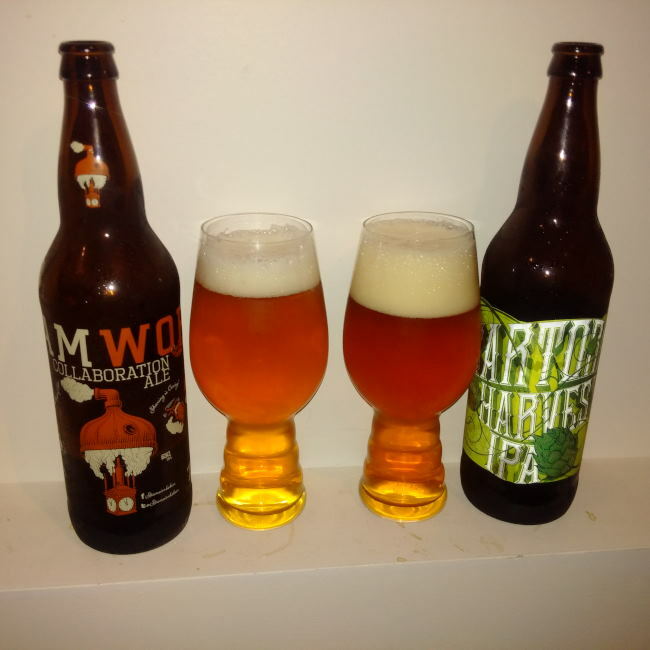 This entry was posted in India Pale Ale and tagged bc, big pine, Burnaby, canada, caramel, cirtrus, citrus, citrus rind, dank, dank finish, driftwood brewing, earth, earthy, fresh hop india pale ale, fresh hop ipa, fresh hopped india pale ale, fresh hopped ipa, herbal, hop attack! fresh hop india pale ale, hop attack! fresh hop ipa, hopped, hops, hops bitter, hops bitterness., medicinal, mild bitter, mild bitterness, orange, pine, resin, steamworks brewing, strong citrus rind, victoria.